This Flagship Program builds on the strong track record of the HarvestPlus program. HarvestPlus and its partners develop and deliver new, more nutritious varieties of staple food crops that provide higher amounts of vitamin A, iron, or zinc, the three micronutrients identified by the World Health Organization as most lacking in diets globally, through a process known as biofortification. Flagship 2 builds on HarvestPlus’ highly successful phases of discovery (2003-2007) and development (2008-2013). Its delivery phase, which started in 2014, introduces new questions on how biofortification can work at scale for specific crops and crop-country combinations. 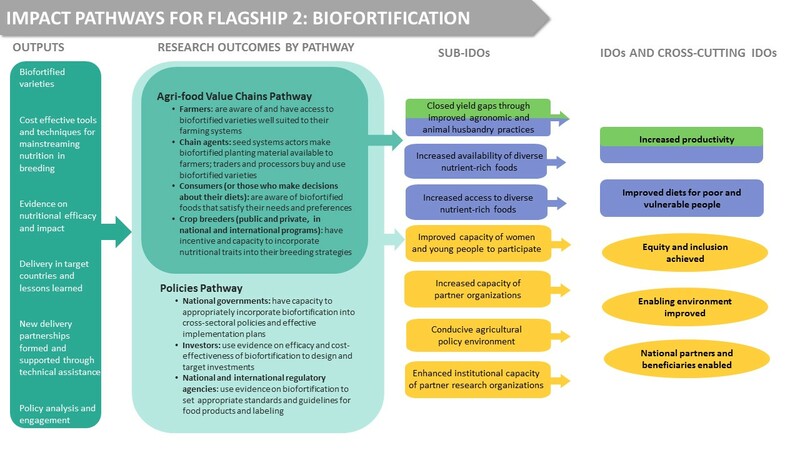 Innovative research in the delivery phase focuses on identifying and addressing technical, social (including gender), and institutional constraints associated with ensuring that 20 million farm households will be growing and consuming biofortified crops in priority countries by 2020. Below is a visual depicting the Flagship 2 impact pathway. CoA1: Crop development mainstreaming and capacity building, which focuses on making sure high-yielding micronutrient enhanced varieties are developed and released in priority countries and that biofortification is mainstreamed into CGIAR and NARS breeding efforts. CoA2: Delivery science and developing lessons learned, which works with partners to deliver high-yielding micronutrient enhanced varieties at scale in priority countries and ensure that evidence on nutritional efficacy and impact informs value chain actors, as well as national and international investors. CoA3: Promoting an enabling environment in order to see biofortification supported by global institutions and incorporated into plans and policies by stakeholders. 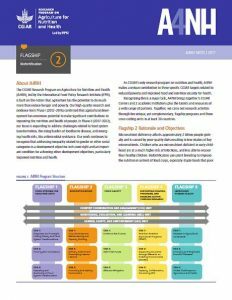 Read more about Flagship 2 and A4NH's work on Biofortification, as well as other news and updates on this topic. ** To learn more or engage directly with this Flagship Program, please contact the designated Flagship Leader.